A mix of carrot, swede, onion, kale, celeriac, and pearl barley with herbs, garlic puree and black pepper. 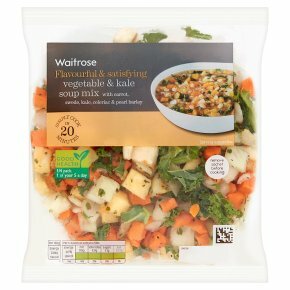 INGREDIENTS: Carrot, swede, onion, kale (7%), celeriac, pearl barley (5%), thyme, parsley, garlic purée, black pepper. SIMMER 20mins:…Open bag and remove the pearl barley sachet. Tip the rest of the vegetables into a saucepan and sweat for 5 minutes. Open the sachet and add the pearl barley. Add 600ml of boiling water and one vegetable stock cube or 600ml of vegetable stock and then return to the boil. Reduce the heat and simmer for 15 minutes or until tender. Liquidise briefly to bring the soup together and serve.